I needed to talk myself into coming here after a short layoff from Chinese noodle joints. I had been busy trying different ethnic cuisines recently to bring variety into this blog for my reviews. Along the way I felt like a druggie badly trying to kick his addiction in cold turkey without any rehab help. Hence, my yearning for some Chinese noodles. The big attraction in coming to Malan Han was their 7 varieties of noodle are made in the restaurant. Right behind the cashier counter is where the magicians get to show off their tricks by pulling the dough like a xylophone and then cut these dough into smaller pieces before cutting it even more to the noodle variety as the finished product it will become. 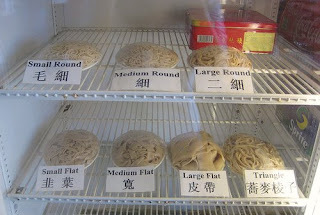 The 7 types of noodles you can order here are: small round, medium round, and large round noodles. While they also have three types of flat noodles ranging from small to large and a triangle noodle. The round noodles are looks like a string of yarn in a spaghetti style while the flat acts like a pasta noodle. Please check out the photos below to get the idea on the variety of noodles. Thanks to Eileen for the photo. What comes next takes some imagination to complete the meal. All they did was to pour a made ready broth on to the bowl of the cut noodle. It's not really that unique nor was it any special ingredient on it. They did cut some small pieces of green onions and generously mixed all over the soup. You can choose type of noodle bowl you wanted, but my guess would be that the broth will remain the same with the proteins being the only different thing on the bowl besides the noodle. The noodle texture was very smooth and very easy to chew. The flavor wise on these noodles was OK. On this particular occasion I have chosen a medium flat noodle to be on my beef noodle soup. For many years, this was my favorite type of noodle at this location because it was simple and easy to pick this noodle up with the chopsticks. Plus it wasn't too long to slurp and fished noodle string. The large flat or large round noodles tend to be too long or thick for me to finish off. Biting off the noodle at mid stream while chewing the noodles will tend to make a foreseen big splash. I had that mishap happened once as it did with the soup splashed all over my white t-shirt by leaving leaving a stain and the spillage was touching the cold dish appetizers. The slices of beef was solid, but not remarkable to separate from other places. You can add your own seasoning or spices with a tray of different pepper and chili on the table for your own mixology on your noodle soup. Overall, this place was solid for a quick bite. The service is very quick with only one waitress handling the entire place. Then again, if you have watched the cartoon movie "Kung Fu Panda", you would know that this place was probably have only thing going for it....noodles, nothing but noodles. It should not be that hard. Self serve on the hot tea or cold water after the waitress bring the first cup to you on the table. Very low maintenance and very low key in every regards about the entire place and noodle. It's a shame that the price couldn't be any lower ($7 for the bowl).